According to the decision of the Permanent Synod of the Bishops of the UGCC on September 12, 2018, the Father and Head of the Ukrainian Greek Catholic Church, His Beatitude Sviatoslav, appointed Fr. Lyubomуr Yavorsky as the new patriarchal econom of the Church. Before Fr. Lubomуr was the Deputy Chief of the Department of Military Chaplaincy. The former patriarchal econom for fourteen years was Bishop Vоlоdуmуr (Vijtyshyn), Metropolitan of Ivano-Frankivsk. 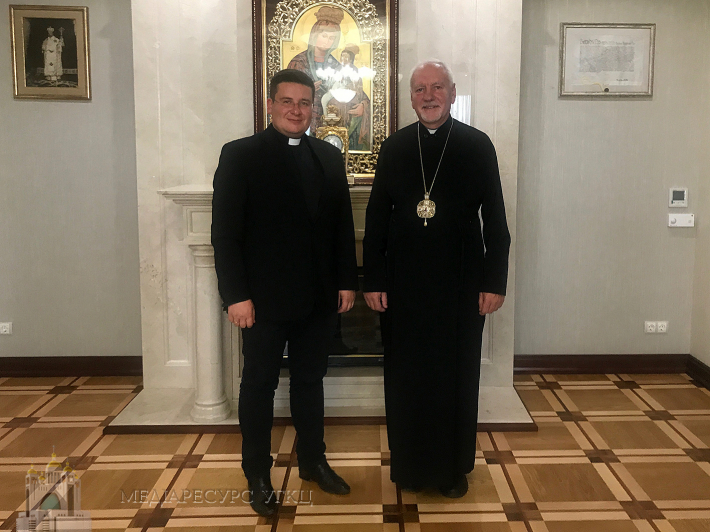 "His Beatitude Lyubomyr called me, a young bishop,” shared the comments with the Department of Information of the UGCC, Bishop Volodymyr. It was not until the year that I was appointed as a bishop-assistant to Kolomyia. I told His Beatitude that I can not refuse him, but if he could find someone else, I would gladly pass on these responsibilities." Speaking about the role of the economy in the Church, Metropolitan Volodymyr emphasized that this is an important component, since the UGCC is actively developing. "But I would not like to allocate a separate role to the economy, because we all work as a single unit. We were an integral part of creating a residence in Knyazhychі, moving the Head of Church to Kyiv, creating a Patriarchal Center in Lviv, building a Patriarchal Cathedral, Patriarchal Administrative Center. For this whole work, we thank God, remembering that we did not have all of this twenty years ago," said Bishop Volodymyr. "I prayed for Father Lyubomyr," said Metropolitan Volodymyr," so he did not refuse. I would like to wish him patience, to involve the laity more actively in cooperation, so that people understand the needs of the Church better. God's blessing to Father Lуubomyr!" For his many years of service, His Beatitude Sviatoslav rewarded Bishop Volodymyr with Patriarchal Diploma. "You have fulfilled a hard and responsible ministry. Before you there was a difficult task to order the financial activities of our Church on the basis of clear accountability and transparency," says the letter. "While you were working as the econom for our Church, the transfer of the seat of the Father and the Head of the UGCC from Lviv to Kyiv took place. Thanks to the professional approach and prudence, you responded well to this challenge. Thanks to your efforts, hundreds of successful projects and programs have been found to have contributed to the establishment of partnerships. And today you can enjoy the respect and trust from the Bishops of our Synod, numerous foreign and domestic philanthropists and church workers," emphasizes the letter.